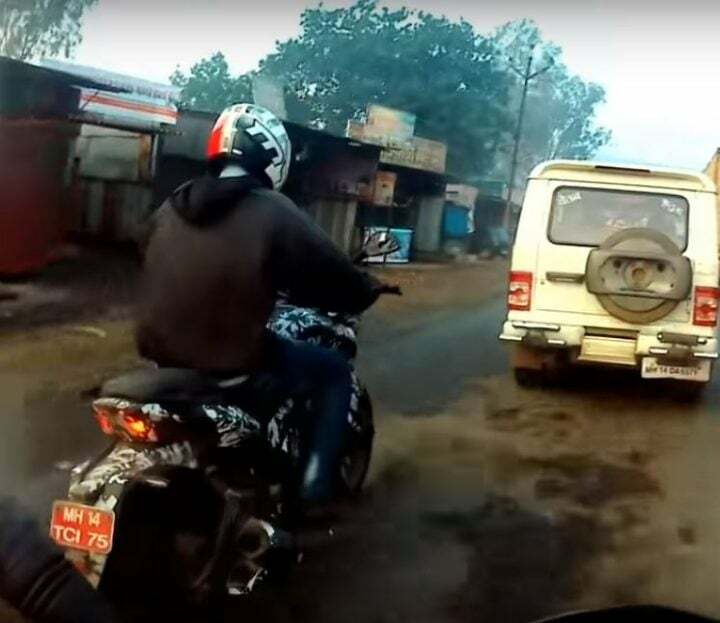 2019 Bajaj Dominar caught testing on video! 2019 Bajaj Dominar will get some mechanical upgrades for better performance, as seen in the video. The power cruiser might launch by early 2019 in India. Bajaj Dominar (Read More) is the most powerful and modern-looking offering from the homegrown two-wheeler manufacturer. It comes with premium features and a powerful 373cc engine, that defies the other Bajaj bikes. We all know, Bajaj is going to update this power cruiser for better performance and ride quality. After a couple of spottings, here is a video of the cruiser testing under heavy camouflage. As said earlier, it will receive some mechanical upgrades. Given that, the prices will again increase. Already, Dominar has seen 3-4 price hikes since its launch. First of all, it will get upside-down telescopic forks, replacing the conventional forks. As we see, it gets a new set of twin exhaust muffler, an increased ground clearance and restyled rear view mirrors. Also, the catalytic converter has been placed next to the rear tire instead below the engine. A bigger radiator is used for better engine cooling. There are reports suggesting that the Dominar 400 might get a ride-by-wire system. Based on the earlier spied pics, it might also get a revised instrument cluster. The revised cluster will show information like distance to empty, average fuel economy and instantaneous fuel economy. Mechanically, it will continue to be powered by a 373cc engine, shared with Duke 390. The engine cranks out 35 BHP max. and a peak torque of 35 Nm. The engine pairs up with a 6-speed gearbox with a slipper clutch. The 2019 Bajaj Dominar will get the BS-VI version of this engine. Bajaj Dominar comes with features such as Auto-headlamp On, LED headlamps, Twin-Channel ABS, Reverse Split Screen Display and obviously, a power cruiser feel. With the upcoming safety norms, Dominar will have twin-channel ABS setup as standard fitment. The 2019 Bajaj Dominar might also see some new colour additions as well. With all these additions and revisions, the prices of Dominar will increase by around Rs 7,000 or so. It is Bajaj’s most expensive model in the lineup. Bajaj Dominar is an average performer in Bajaj’s overperforming lineup. It has the looks, the power and the features. However, it is a pure lifestyle bike, which fails to attract a daily-commuter targeted buyer. Also, at this point, it receives competition from Royal Enfield Classic 500, which is a more preferable cruiser. The prices of the power cruiser start off at Rs 1.49 Lakhs for the non-ABS and Rs 1.63 Lakhs for the ABS variant. At this price, it competes with Royal Enfield bikes and Mahindra Mojo. Here is the video of 2019 Bajaj Dominar 400 testing near Pune.